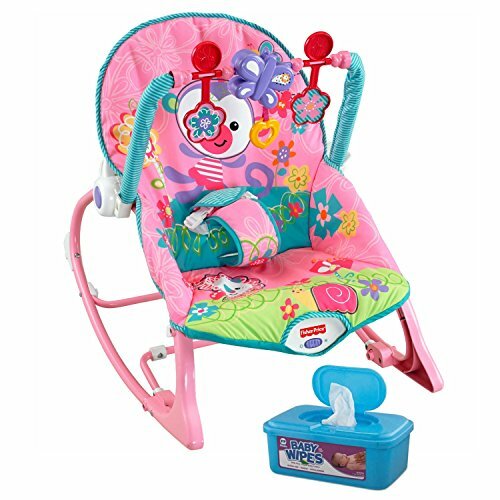 Fisher-Price Infant-to-Toddler Multi-Purpose Play, Seat, and Feeding Rocker with Baby Wipes, 128 Count by MegaMarketing at Indsight. Hurry! Limited time offer. Offer valid only while supplies last. A seat for play, a seat for feeding, a seat for rest-and it grows with baby! Bat-at toys keep baby entertained and help strengthen baby's senses. A seat for play, a seat for feeding, a seat for rest-and it grows with baby! Bat-at toys keep baby entertained and help strengthen baby's senses. Calming vibrations and a reclining seat help soothe. Easy transitions let you use it from infant to toddler-up to 40 lbs (18 kg). Fisher-Price Infant-to-Toddler Multi-Purpose Play, Seat, and Feeding Rocker: Use from infant to toddler-up to 40 lbs (18 kg)!